A: At Hirschler, I truly feel the firm and my supervisors are invested in my professional development. Early on in my practice, I was routinely engaged to assist on complex real estate transactions—meaningful work for any associate, and certainly for a younger associate. Q: As a 2L at the University of Virginia School of Law, what was it about Hirschler’s program that appealed to you the most? 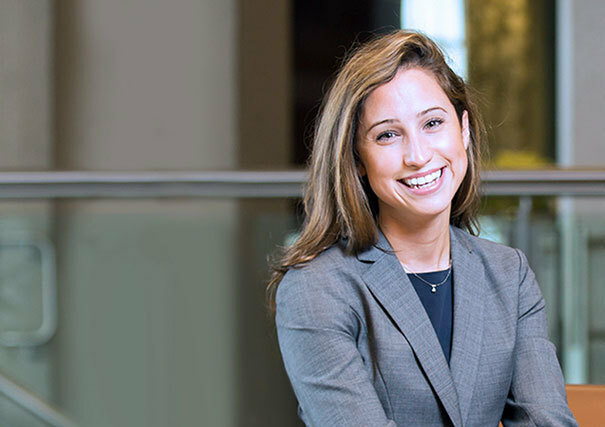 A: During my interview for a summer associate position at Hirschler, I shared my passion for the environment and an interest in environmental and real estate law. Though initially concerned that my interests would not be satisfied working within a single practice group, I was reassured by my interviewers’ discussion of the firm’s entrepreneurial spirit. On the first day of my clerkship, a firm partner who had been made aware of my interest reached out for help on a research project involving a storm water permit. Not only had my interviewers noted my interest, they had already made others in the firm aware of my desired practice group direction! It was a great demonstration of the firm’s support for my long-term goals. Q: Your early career as a paralegal confirmed your interest in attending law school and working at a law firm. What would you tell law school students about following their passion? A: Once you’ve found an area of practice that makes you tick, be selective about your extracurricular activities and coursework. Begin tailoring a thoughtful, cohesive message of your unique skills and perspectives that will immediately add value. As a first-year associate, don’t be shy about expressing and exploring your interests through pro bono opportunities or collaborating with lawyers outside your immediate practice area; other lawyers will be impressed by your initiative and you may find a new mentor. Q: How would you describe your work experience in the first 12 months? A: I spent my first year working on varied substantive projects for national and local commercial real estate clients. Some of my favorite projects were serving as a point of contact for time-sensitive real estate closings and researching environmental permitting requirements for different development interests. I was fortunate to work alongside senior partners on complex deals involving real estate, environmental, zoning and land use issues, which often required communicating directly with clients and collaborating on research and drafts with colleagues of all experience levels and specialties. Q: How have you benefited from the firm’s “open door” culture? A: The firm’s open door culture was a significant help to me in Year One. As an associate, it is comforting to know I can ask any partner or associate for advice on a client matter during a complex transaction. Beyond the obvious work and educational benefits, Hirschler’s open door environment encourages active cross-practice collaboration.